This was a case of filariasis caused by Wuchereria bancrofti. 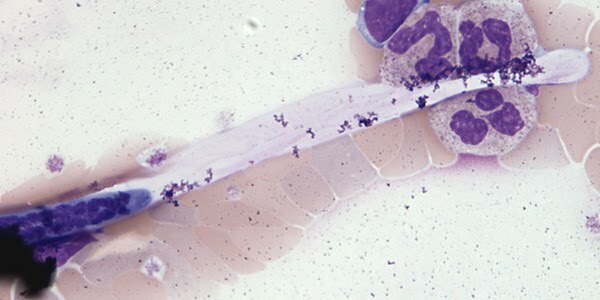 Size of the microfilaria was consistent with that of W. bancrofti (244-296 µm). Nuclei were not present all the way to the end of the pointed tail (anucleate tail). Relatively short cephalic space (the area where there are no nuclei in the anterior end or head). Congrats to those who have answered it right. Ms.Neha, Ms.Tanushka and Mr.Siva are the recipients of IYI Surprise gifts for the first 3 correct entries. We require the email ids of the three winners and request the winners to send a mail to vignesh@themicrobiologyblog.com.